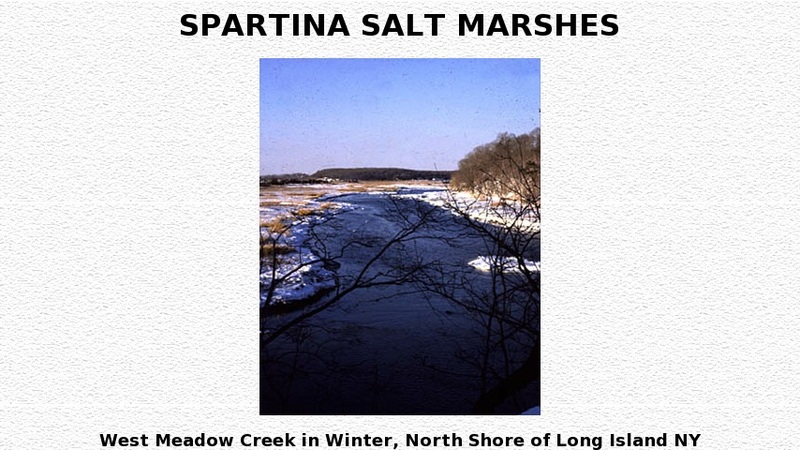 High school level and higher description of Spartina salt marshes with pictures. Page is full of fantastic photographs most featuring a descriptive caption. Topics discussed include zonation, succession, and the intertidal zone. The habitat's associated flora and fauna are discussed. Organisms of particular interest include: Spartina alterniflora, Spartina patens, Geukenzia demissa, Mytilus edulis, Distichlis spicata, Salicornia, Melampus bidentatus, Ilyanassa obsoleta, and Hydrobia totteni.